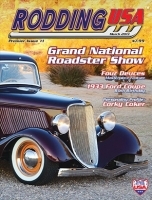 Rodding USA's Premier Issue#1 is sold out. Issue #1 features two masterpiece features. One of Ken Sutton's 1933 Ford coupe and the other on Bill Ewing's fabulous collection of four deuces. That's backed by an additional four hot rod features plus four special interest features which includes a Personality Profile on hot rod industry icon Corky Coker. We also take a look inside a genuine hot rod museum and lift the doors on a hot rodders' garage for a peek inside at something special. Our premiere issue event coverage features an extensive (14-page) feature on the Grand National Roadster Show held just a few weeks ago plus coverage of the GoodGuys South West Nationals and the California Hot Rod Reunion. If you're into doing it yourself then check out our Tech features too! We' got a product showcase and much more. Rodding USA…by hot rodders, for hot rodders.